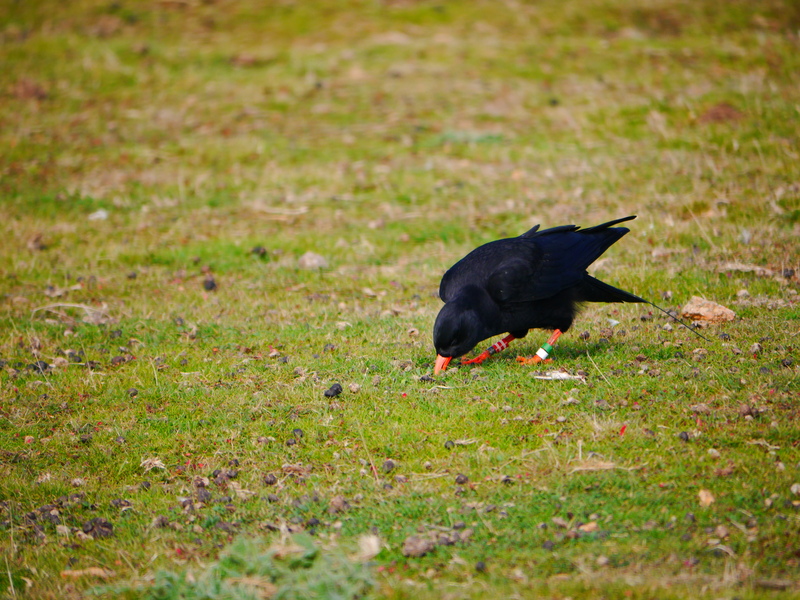 Jersey’s free-living chough population now stands (and flies) at twenty-two individuals since the release of the captive-reared chicks in September. So how have they been coping with life on the north coast? The Jersey flock probing for insects on the grazed and at Sorel. Photo by Tim Morley. Arguments around the dinner table. Photo by Liz Corry. The seven young captive-bred choughs have integrated well into the free-living flock. Social ‘pecking order’ was established relatively quickly with most of the bickering being between the juveniles and restricted to feed times at the aviary. It also tends to be the boys more than the girls who squabble. Brothers Kevin and Lee always bicker at feeds, but spend the rest of the time preening each other. A true ‘bromance’? Kevin waiting to see if Lee will share what he finds to eat (I doubt it!). Photo by Liz Corry. They are quite competent at searching for wild insects. Bills buried deep in soil and sheep muck. Kevin and Lee even turned their attention to a fresh mole hill, pretty much levelling it in their quest for food. Noir, a 2015 captive-reared chick, digging for insects. Photo by Liz Corry. Ormer demonstrating why a chough needs such a long bill. Photo by Liz Corry. 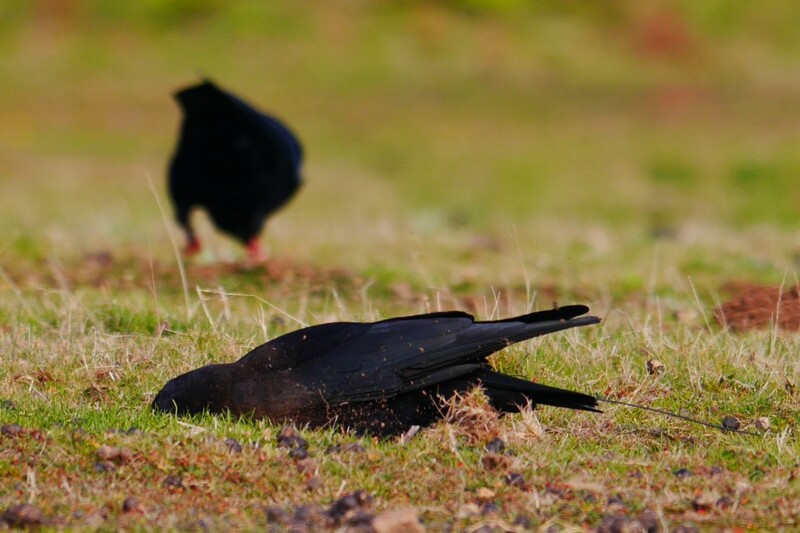 As the cold, wet winter weather sets in the abundance of insects living in the soil decreases, which means the choughs’ wild food supply becomes limited. Like their neighbours in the UK they look for alternative food sources at this time of year to top up their calories. 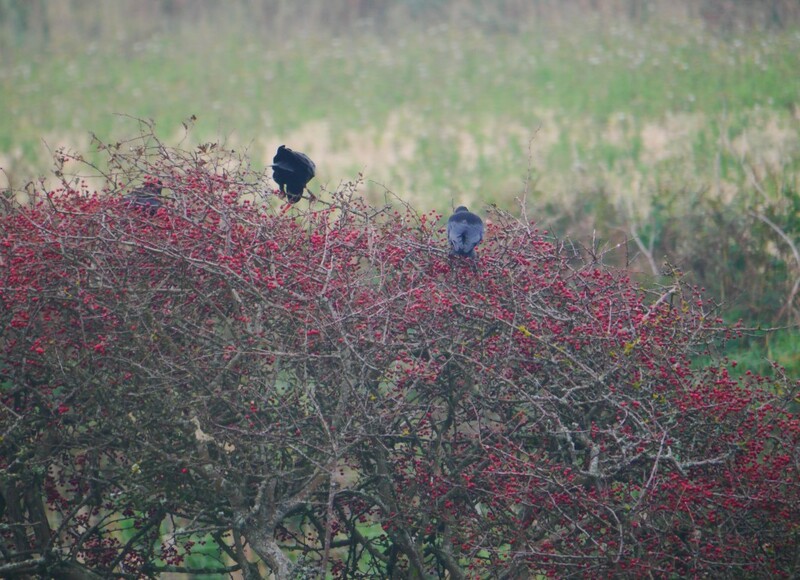 Last winter the group showed a great deal of interest in the hawthorn berries around the aviary. This year was no different and the new chicks joined in with the foraging. 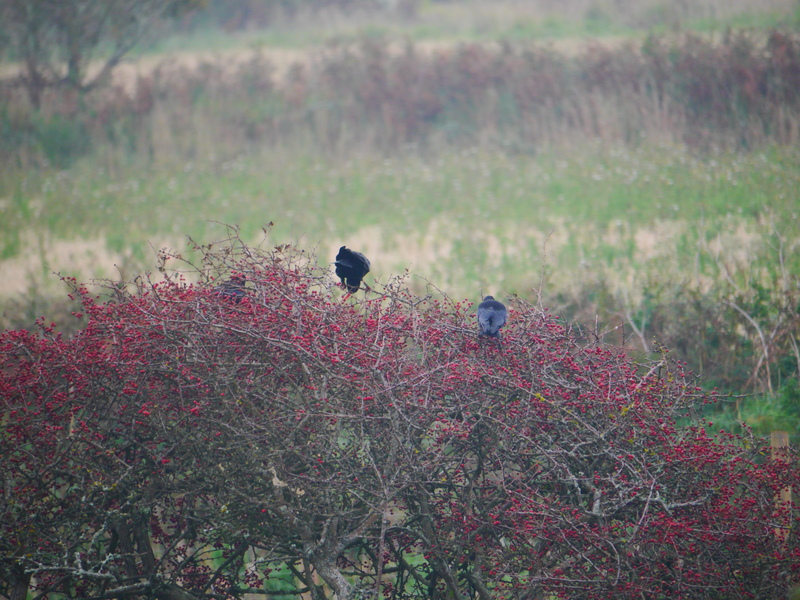 Choughs use the hawthorn trees around the aviary site as a vantage point to rest and preen as well as a food source in the autumnal months. Photo by Liz Corry. 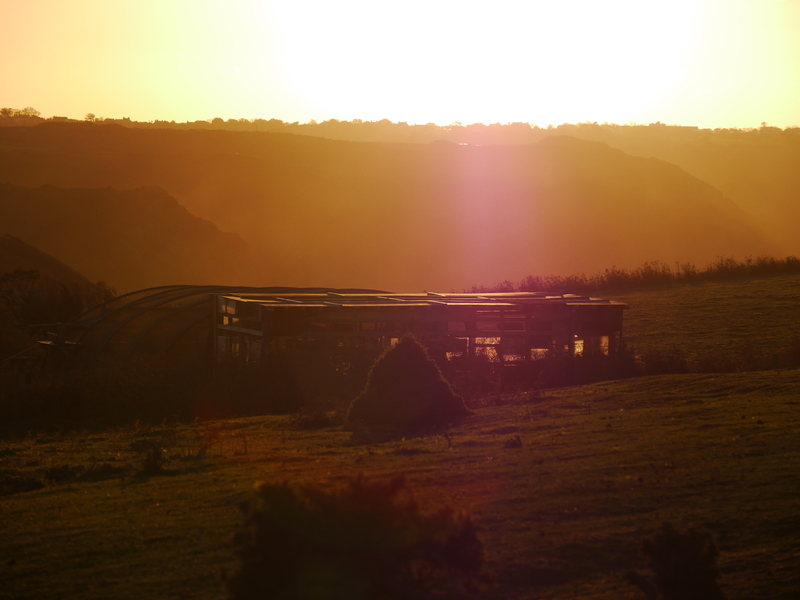 Release aviary at sunset. Photo by Liz Corry. After a busy day of hunting for insects the new choughs go to roost in the aviary along with the other juveniles. 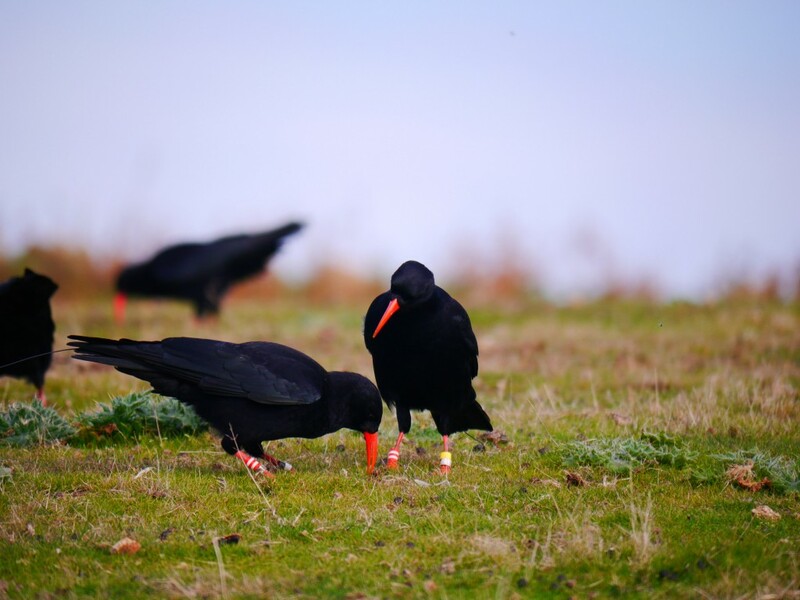 Prior to their release in September there were seven choughs roosting in the quarry, Dusty had left his parents and joined the aviary roost group. This appeared to stay the same after the release. 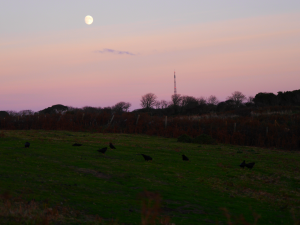 The choughs continued to forage once the sun had set. Photo by Liz Corry. 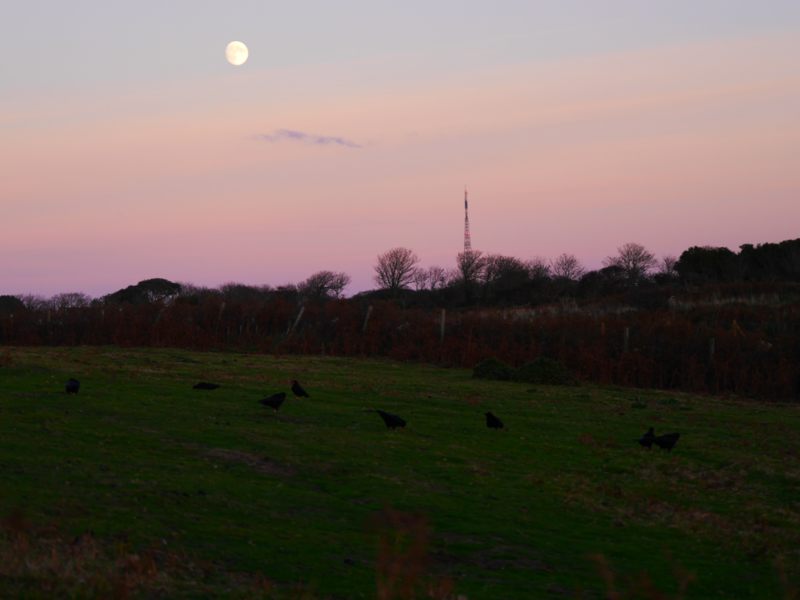 However, when the clocks changed on 25th October field-staff made a new discovery: A clear sky and a bright, almost full, moon provided enough light for the choughs to carry on foraging near the aviary once the sun had set. To be fair, their internal clocks may have been slightly skewed (with ours) making them think they had at least another hour before bed. 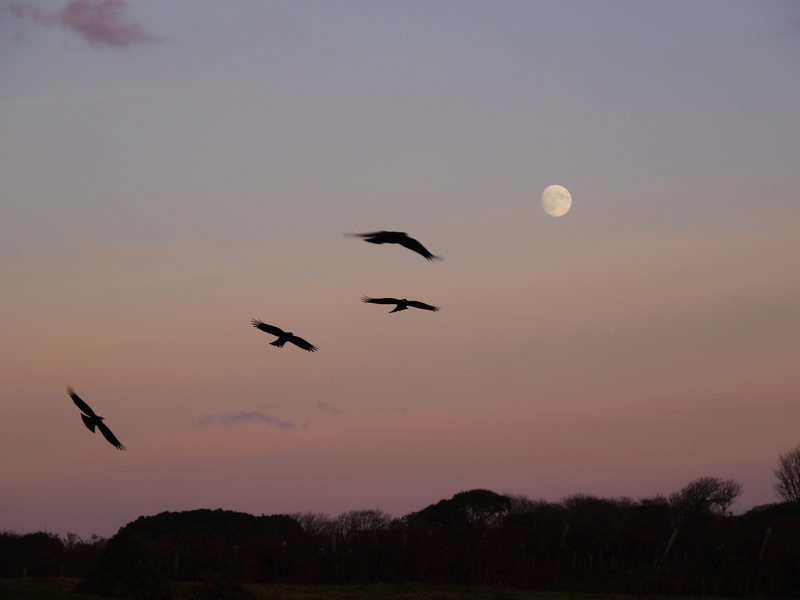 Flying in to roost. Photo by Liz Corry. Suddenly the birds took to the air and headed straight for the aviary. At least one pair broke away and shot off to the quarry. Two others disappeared from view. Had they sneaked into the aviary via the other side? Had they left for the quarry, but been missed in the melee of choughs flying around the aviary? All we knew was at least 18 roosted at the aviary; four more than normal. We repeated our roost checks and also checked in with Ronez Quarry to see what information they could provide. We now know that White and Mauve still roost in the quarry. The remaining adults, Green, Blue (Mrs Green), Black, Red, and her young man Dingle, all roost at the aviary. 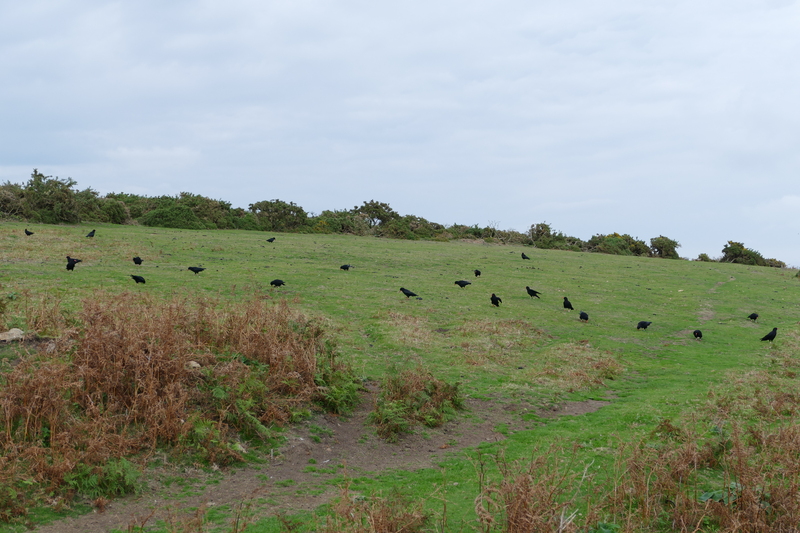 There have also been changes in where the choughs hang out during the day. Breakfast time is spent over at Devil’s Hole no longer near the heather regeneration area on the east side of Mourier Valley. Foraging for breakfast at Le Marionneux (west side Mourier Valley). Photo by Liz Corry. We knew of their visit to Les Landes last month thanks to public sightings. 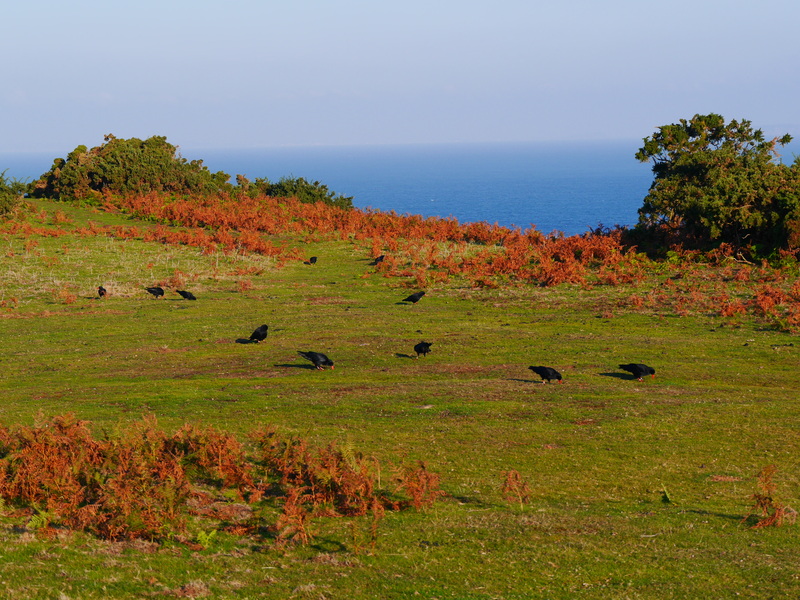 This month we have had several sightings of choughs flying around le Câtel Fort, Grève de Lecq, which is halfway between Les Landes and Sorel (as the chough flies). Many thanks to Keith Pyman for those reports. He was lucky enough to see them pretty much once a week throughout October flying over his house. We cannot physically get there in time to know where they go after that. Are they passing Grève de Lecq on the way to Les Landes? Are they just scoping out the cliffs at Petit Grève? All we know is that they are back at Sorel in time for their lunch feed acting all nonchalant. 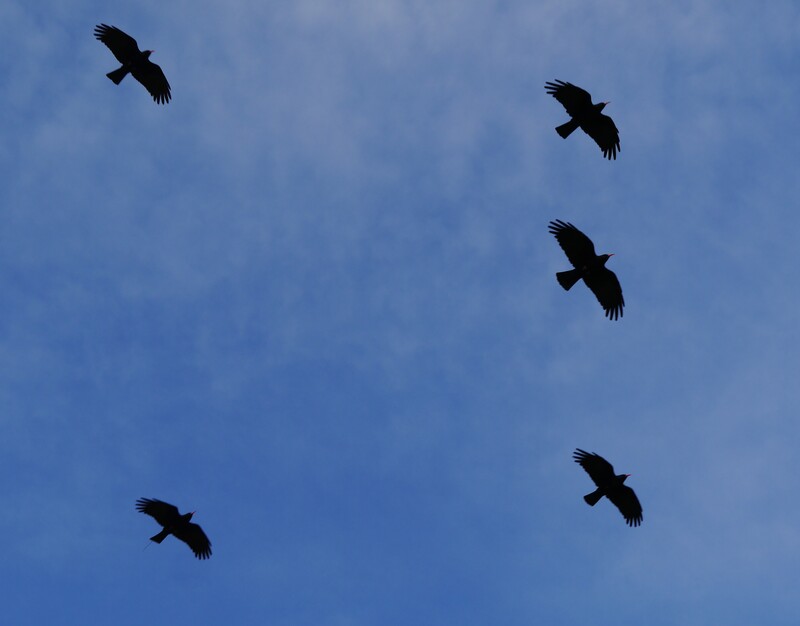 Not every chough made the journey beyond Devil’s Hole in October. 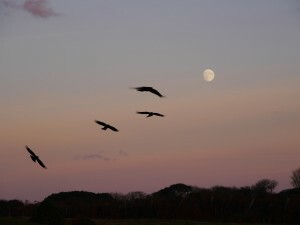 Sometimes it is just four birds, at other times it is a group of seven or fourteen. We cannot be sure which individuals travel without being there to see their leg rings. Even then it requires them to be on the ground not flying with their feet tucked in. The radio-tracked group of seven tend to favour staying at Mourier Valley. Again not having transmitters attached to the other 15 doesn’t help our chances of being able to identify those who wander off. 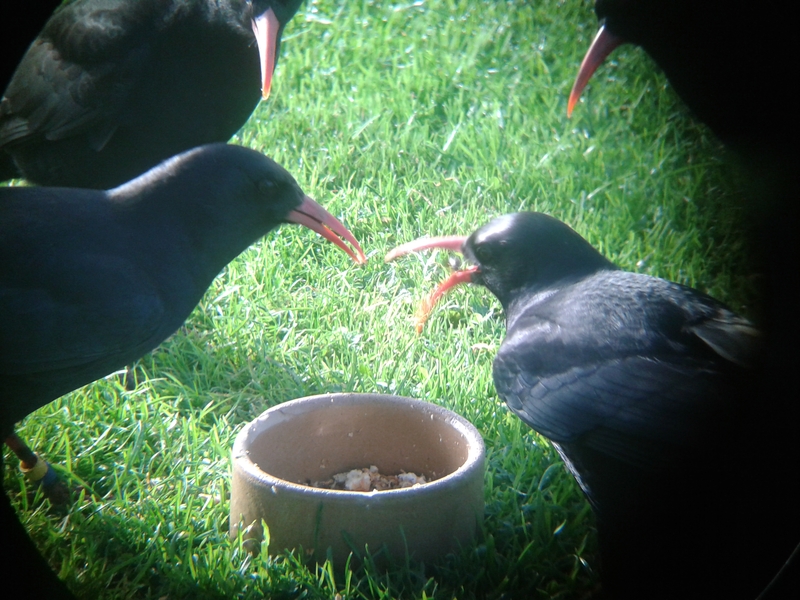 One thing we can be certain on is the health of our choughs. Our close daily monitoring allows us to know when something is wrong. When that something is Dusty, Jersey’s wild-born chick, our own stress levels tend to increase let alone the bird’s. A fortnight into Nicola Cox starting her six-month student placement on the project she spotted Dusty occasionally open-mouthed breathing. This could be due to several different reasons most of which are mundane and fleeting. We continued to monitor him closely and could see that his breathing was gradually becoming laboured and he started sneezing. We know this usually means one thing and a faecal sample from Dusty confirmed it. He had Syngamus, a gapeworm, and in quite high numbers. Thankfully this is very treatable, but it did mean we had to catch him up to worm him. The easiest, least stressful way of doing this was to call all twenty-two choughs back to the aviary just before roost and lock them in. I held off giving them their afternoon feed until then to ensure they were all motivated enough to stay inside the aviary eating. First thing the following morning we went in and caught Dusty in hand-nets. Within minutes Dusty had been checked over by the Vet, given medication, and the whole group given access back outside. 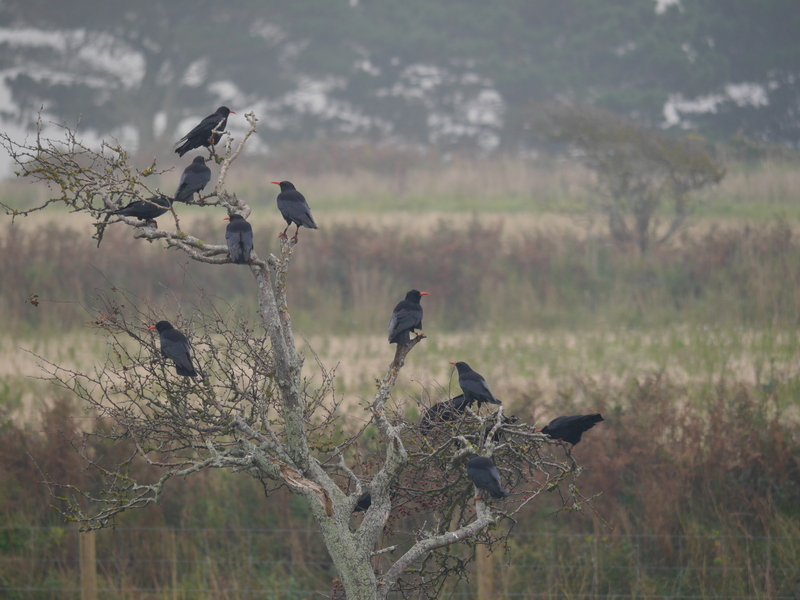 The choughs appeared unfazed and within a couple of days he had stopped sneezing and breathing normally. Quite an exciting and thankfully positive end to the month. The use of neonicotinoid pesticides, linked to deaths of bees, may be contributing to the decline of butterflies in the UK, a study has revealed. Previous research has demonstrated that these chemicals, widely used in agriculture, appear to be harming bees, birds and other wildlife. 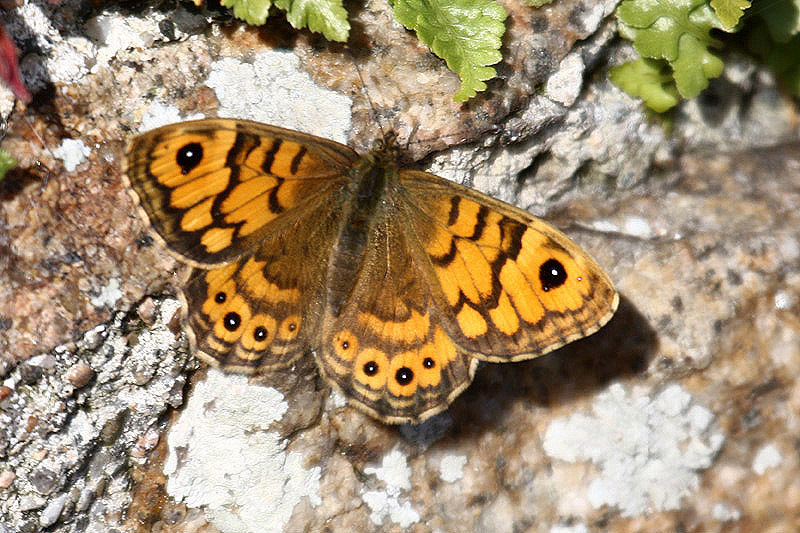 But the study (published by PeerJ) by the Universities of Stirling and Sussex in partnership with Butterfly Conservation and the Centre for Ecology and Hydrology is the first scientific evidence of a possible negative impact on widespread UK butterflies. Neonicotinoids were introduced in the mid-1990s as a replacement for older chemicals. They are a systematic insecticide, meaning that they are absorbed into every cell in a plant, making all parts poisonous to pests. The chemicals remain in the environment and can be absorbed by the wildflowers growing in field margins, many of which provide a nectar source for butterflies and food-plants for their caterpillars. The study found population trends of 15 species showed declines associated with neonicotinoid use, including small tortoiseshell, small skipper and wall. 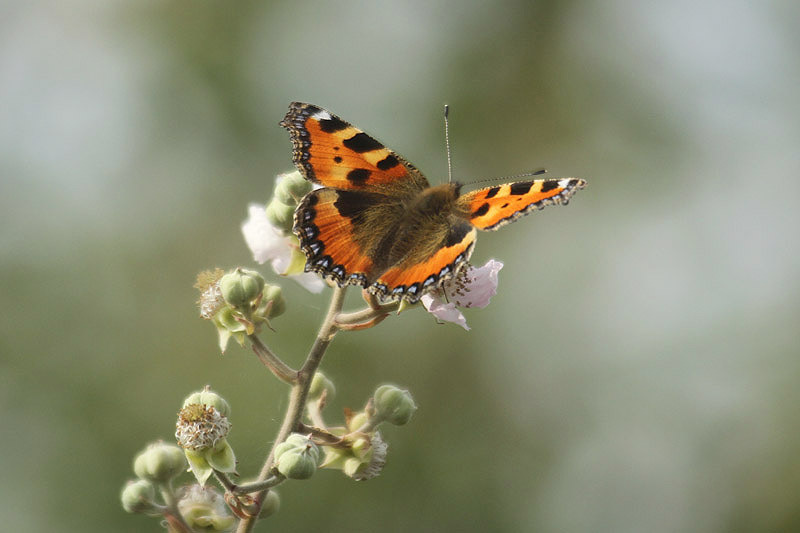 Dr Tom Brereton, Head of Monitoring at Butterfly Conservation, said: “We are extremely concerned with the findings of the study and are calling for urgent research to see whether the correlations we found are caused by neonicotinoid use, or some other aspect of intensive farming. 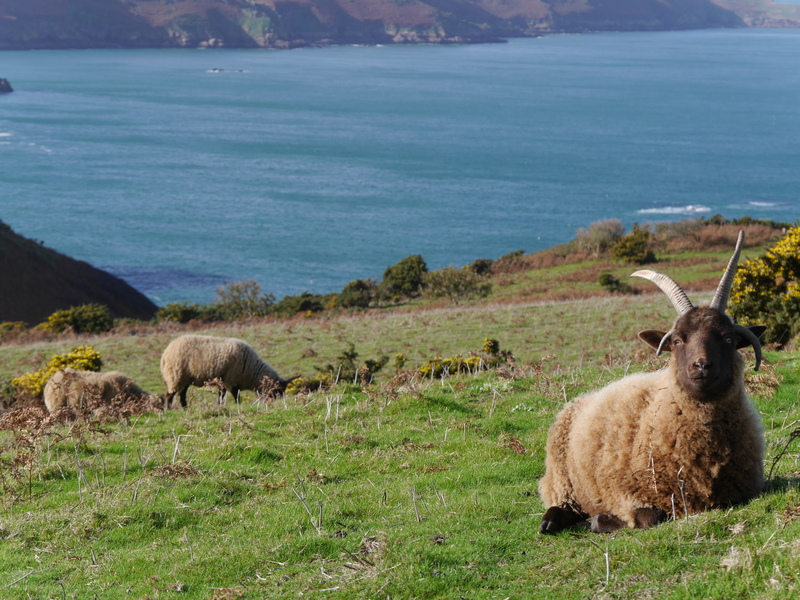 They might not seem like it at first glance, but the sheep at Sorel are part of a special task force deployed in Jersey to help protect and serve the Island’s biodiversity. And now to boot they have celebrity status! Having featured on BBC’s Countryfile back in summer and subsequently attracting tourists to the north coast they have once again hit the headlines with ITV Report. The report by Katie Robinson (ITV Channel) can be found by clicking here or following The National Trust for Jersey‘s Facebook page. There is a nice video as well featuring ranger Neil Harvey and a cameo from the chough flock. 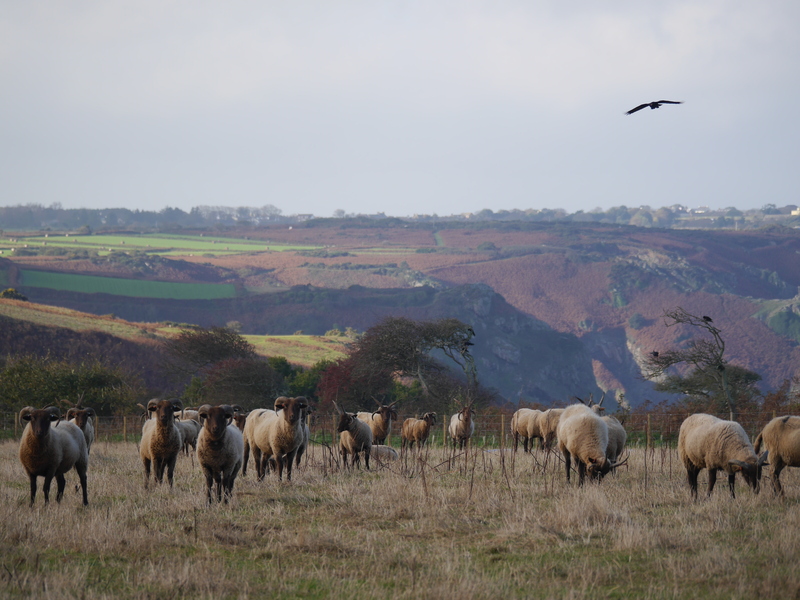 Having been established back in 2009 with just 20 breeding ewes and two rams, Jersey’s conservation grazing flock of Manx loaghtan sheep is now almost 200 strong. 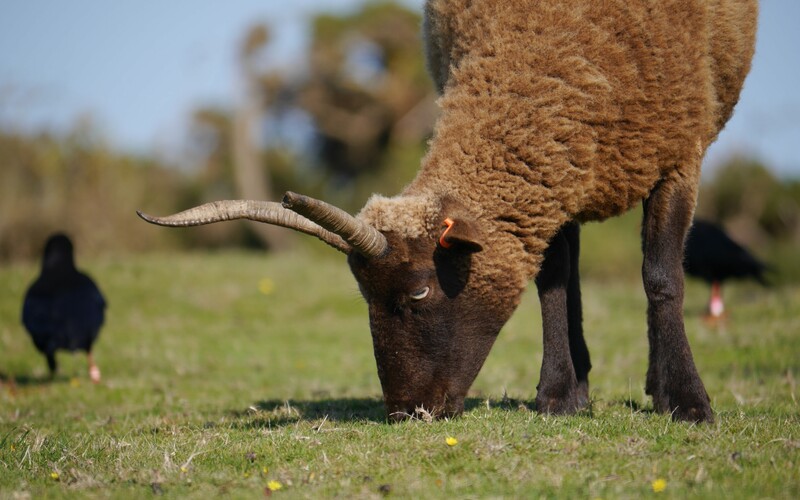 The Manx loaghtan, a hardy rare breed thought to be the closest living relative of the now extinct Jersey sheep, originate from the Isle of Man. Since their introduction, the flock have been invaluable in addressing the widespread ecological degradation that has taken place along Jersey’s north coast. 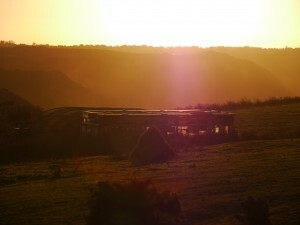 Historically, the coastal headlands and slopes on Jersey’s north coast were grazed; however changes in Jersey’s economy during the early 20th century led to the cessation of traditional mixed farming practices on marginal land. When active management ceased, the semi-natural open grassland and heathland habitats characteristic of traditionally farmed marginal areas began to be invaded by bracken and scrub. The invasion of bracken in particular, which now blankets vast swathes of land along the north coast of the Island, has sadly led to a widespread decline in biodiversity. 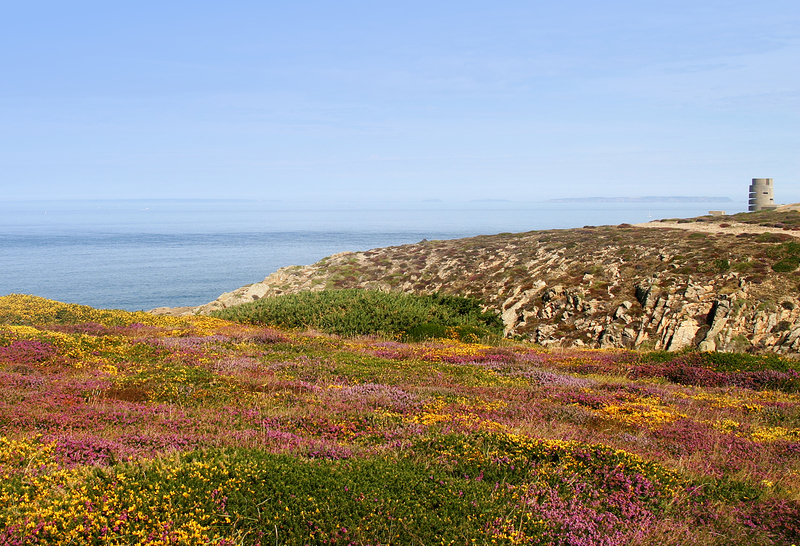 Reinstating active management is the key to restoring species-rich semi-natural maritime grassland and heathland habitats. The Manx loaghtan flock contribute enormously in this respect. 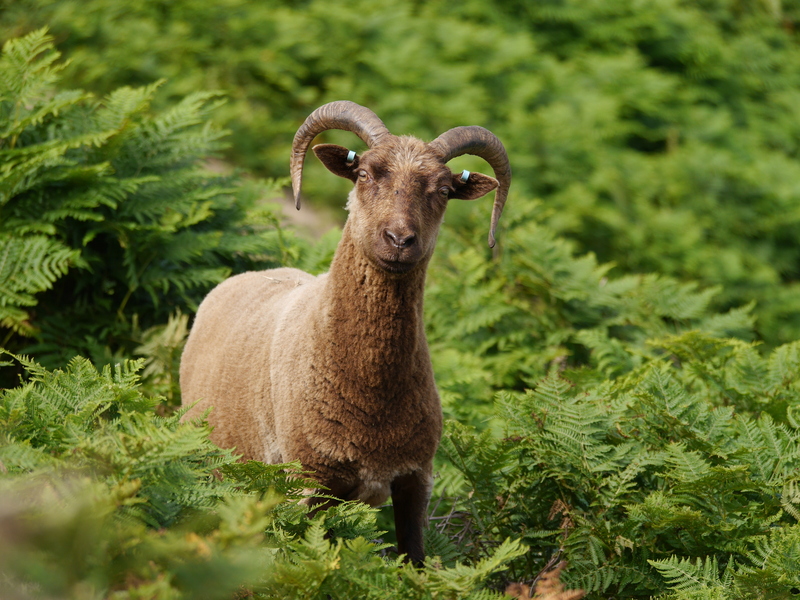 Through the action of trampling, the sheep help to reduce the cover of bracken, while grazing controls the growth of competitive plant species, prevents scrub invasion, and facilitates the development of diverse plant communities with varied sward structures. In addition, patches of bare ground and animal dung resulting from sheep grazing provide important resources for invertebrates. 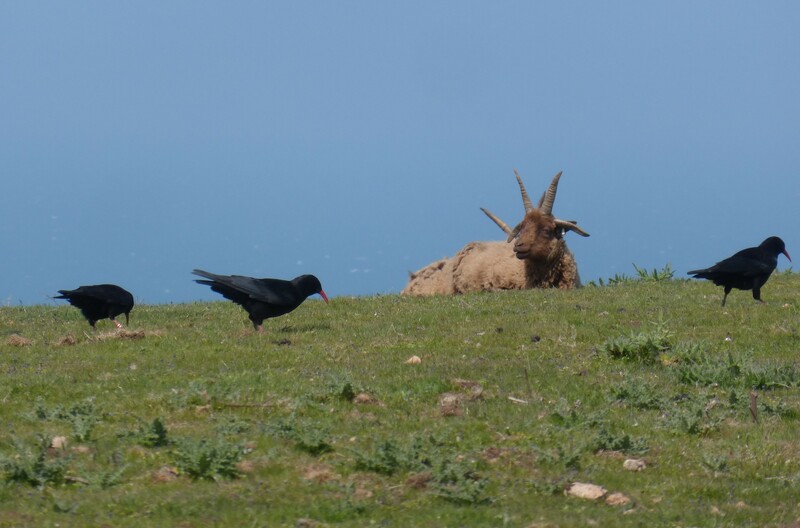 The Manx loaghtan grazing area at Le Don Paton provides ideal habitat for the choughs. 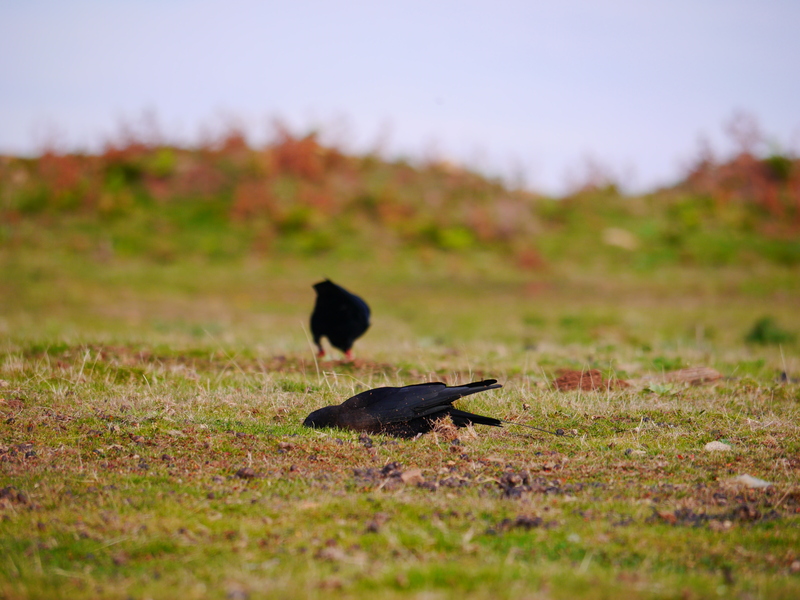 These iconic birds forage for invertebrate prey in areas of short turf and dung produced by the grazing sheep, and also use wool in nest building. In addition to benefiting Jersey’s resident wildlife, the short grassy areas maintained by grazing also provide feeding opportunities for migratory bird species of conservation concern, such as meadow pipit, wheatear and ring ouzel. The increase in the size of the flock is fantastic news as it will allow this highly effective and sustainable management technique to be more widely applied, facilitating the restoration of Jersey’s coastal headland habitat for the benefit of our native wildlife. The flock have proven to be extremely popular with both visitors and local residents alike, to the extent that they are now something of a visitor attraction. An additional benefit of the increase in flock size is the increased production of high quality meat for the local market, as well as wool for craft knitting. 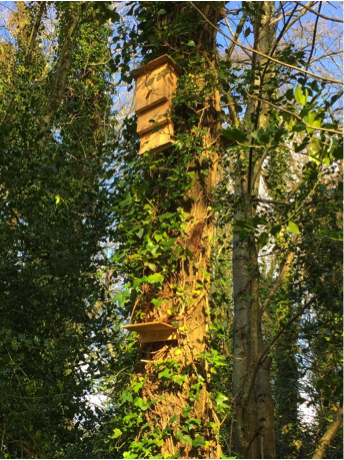 Jersey’s Woodland Bat Project was created in September 2014 and Stage One was to erect 58 Kent bat boxes in five Jersey woodlands including Val de la Mare, St Lawrence (Waterworks) Valley, La Hague water filling station, Don Gaudin in St Peter’s Valley and St Catherines Woods. We also put up five Schwegler woodcrete boxes which are of a much tougher design, one per woodland. These boxes were all put up between October 2014 and May 2015. Importantly, with each box we placed a small shelf underneath the box to collect any droppings that any occupying bats may produce. The Kent box tends to attract crevice-dwelling bats which include the pipistrelle species that we have in Jersey (see list of Jersey bats here). The object in Jersey was to provide more roosting opportunities for bats and to learn more about our woodland species of which there has been little research so far. I obtained the relevant licencing from the Department of the Environment (see Jersey details here) and with a team of volunteers from the Jersey Bat Group we checked the boxes for signs of occupation during the last week of each month after April. Up until September there was no evidence of occupation. However…………. On 30th September I received several excited messages from Cassie, who monitors the Waterworks Valley sites, to say that there were bats in the inner crevice of one of our boxes, WW11. This is one of the higher boxes and lies in an area which has proved very rich in bats – we undertook some static echolocation monitoring in our woodlands during August. I was out of the Island when Cassie made the discovery, but asked if some of the monitors could go down and do some echolocation recordings that night so we could get an idea of which species was in the box. It appears that there were three bats in the inner slot of the box. Echolocation recordings on emergence indicated that the bats were Nathusius’ pipistrelle Pipistrellus nathusii (see also Nathusius’ pipistrelle website) a migrating species which is relatively rare in the UK but has been recorded in Jersey many times since it was first recorded in 1987. There was also one dropping on the shelf which was collected for analysis. The Nathusius’ pipistrelle is slightly larger than the more common, common pipistrelle (P. pipistrellus) and soprano pipistrelle (P. pygmaeus) and weighs around 6-10 grams. 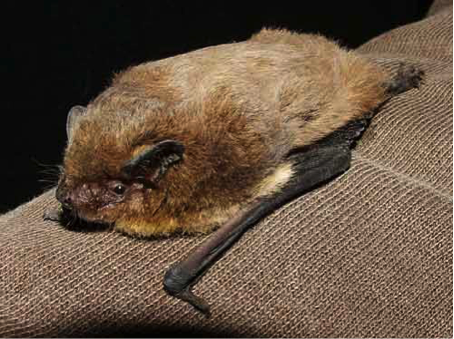 It is of a more uniform colour than the other pipistrelles and is normally distinguished by its lower frequency echolocation, although it can be confused with Kuhl’s pipistrelle (P. kuhlii) which has also been found in Jersey. Cassie kept me informed and the bats did not go away. On my arrival back to Jersey on 20th October I went down to Waterworks Valley and was delighted to find one bat in box WW11. I also looked at some of the nearby boxes and discovered a bat in the outer crevice of WW13. It looked like another pipistrelle but we will need to do some more monitoring to determine its exact species. As these boxes were put up in January it has taken only 8-9 months for two of them to be occupied. I think this is very encouraging for the rest of the project. This winter we hope to put up some more Schwegler woodcrete boxes which are far longer-lived and which have had good results in other projects in the UK. We are grateful to Jersey Water, National Trust for Jersey and the Department of the Environment for permission to use their premises for our project. We also thank the Co-operative Eco Fund for a generous grant toward our project. A big thank you too to the monitors who have inspected the boxes every month. Many thanks to Bedfordshire Bat Group for use of their photograph. 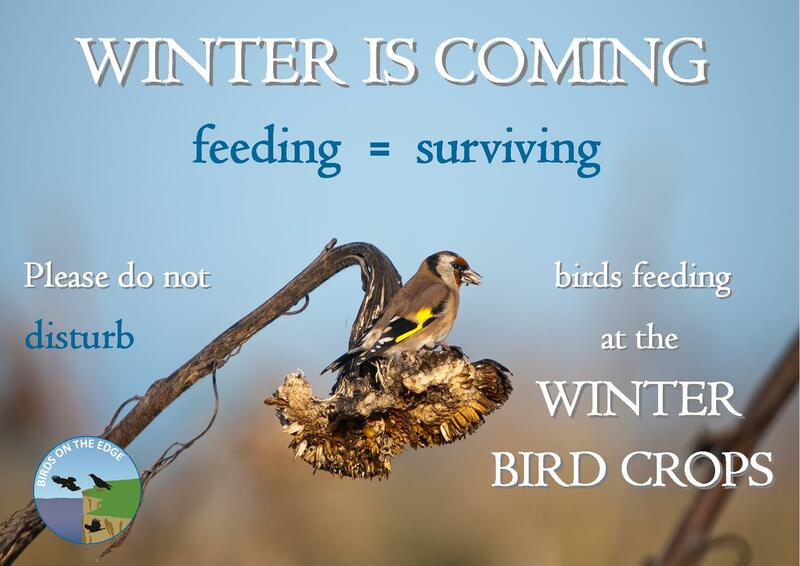 Winter is coming and …..and so are the birds! Note details of forthcoming Birds On The Edge walks below. It’s that time of the year again, when suddenly it seems the summer went by too fast and the cold and the rain arrived too soon. But here at Birds On The Edge we like to be prepared, which is why we started planning this winter’s bird crops back in December 2014. Once again Birds On The Edge and a dozen of our farmer friends got together to discuss where the so-called ‘winter bird crops’ would be planted, with sites, crops and timing with everybody’s approval. The seed was provided by Birds On The Edge and most of the fields were planted between May and July, slowly growing to form the mixture of flowers and other plants that have started to become a familiar landmark in Jersey. 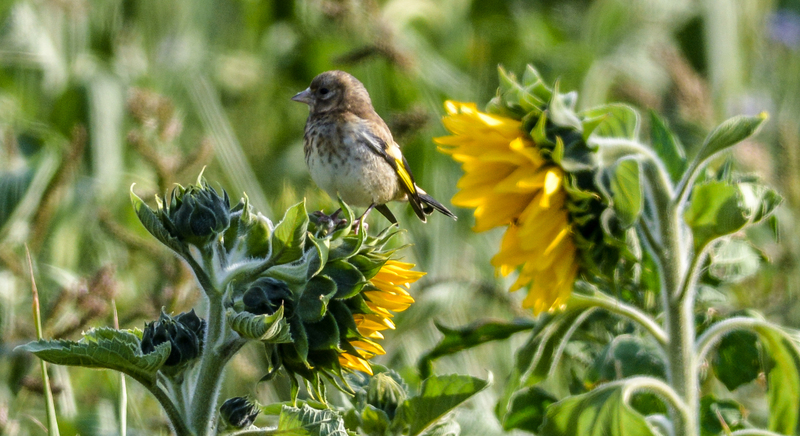 We hope that you have recognized our crops as you drive by or go for a stroll; those large sunflowers and purple phacelia are not easy to miss, but if you look closely you’ll also notice mustard, barley, millet and quinoa amongst others – this mixture will feed the widest range of birds with different beak shapes and sizes. When in full bloom the crops indeed look spectacular, and feed hundreds of bees, butterflies and beetles, but it is now, when they are dried up, looking dull and brown, that they are most appetizing for the birds, for now the seeds have matured and are ready to be eaten. These crops are particularly aimed to help farmland birds make it through the winter, which is the time of the year in which they are most vulnerable. It has been shown that the decline of birds associated with farmland seen across Europe and in the UK is caused by the lack of food available in modern farming habitats, with less stubble fields, weeds and spilt cereals. These crops help birds like linnet, meadow pipit, skylark, reed bunting, cirl bunting, brambling, stonechat, and even chaffinch and greenfinch, to survive the coldest months until the spring, when insects and other invertebrates become more abundant. The winter bird crops have also become more prominent as the scheme has grown from 14 fields at five sites in 2013 to this year’s 47 fields at 12 different sites across the Island. Some of the fields are ‘out in the sticks’ and quite difficult to find, whilst others are near footpaths or areas with public access; in those we have placed signs encouraging walkers to enjoy the birds without disturbing them from feeding. The success of these crops has also increased each year, with 74% more farmland birds per hectare planted out and as much as a 414% increase at the best performing site. New species are often found on the crops, with serin, little bunting and Dartford warbler seen at the crops last winter, and Cetti’s warbler added to our list at one of the sites already this autumn. We have been lucky to receive generous donations and grants to plants the crops every year. The birds are enjoying this winter’s crops thanks to a private donation from a local ornithologist, whilst the monitoring work will be carried out with grants from the Co-Operative Society Eco-Fund and the Howard Davis Farm Trust. And, we already have good news for next year’s crops, as Jersey’s Action For Wildlife have kindly offered to cover half of next year’s expenses. Sunday 15th November at St Ouen’s Pond. 2.30pm, meeting at Kempt Tower car park.